Two members – Commissioners of Escambia County appointed by the Board of County Commissioners of Escambia County. Two members – Council members of the City of Pensacola appointed by the City Council of the City of Pensacola. One member – a member of the Town Council of the Town of Century, appointed to serve by the Town Council of the Town of Century. Two members – Board of Directors from the Pensacola Bay Area Chamber of Commerce, in good standing, appointed by the Chairman of the Board. (PBACC). One member – at large, appointed by the City Council of the City of Pensacola. PEDC is staffed by the Pensacola Bay Area Chamber of Commerce through a management agreement. The financial information and records of PEDC are maintained by the Chamber through that same management agreement and are audited annually. Once the audit is complete, the financials are consolidated into the Comprehensive Annual Financial Report of the County. Each year, the PEDC Commission Members approve a budget. The City of Pensacola and Escambia County are the two sources of income to the entity through an inter-local agreement. 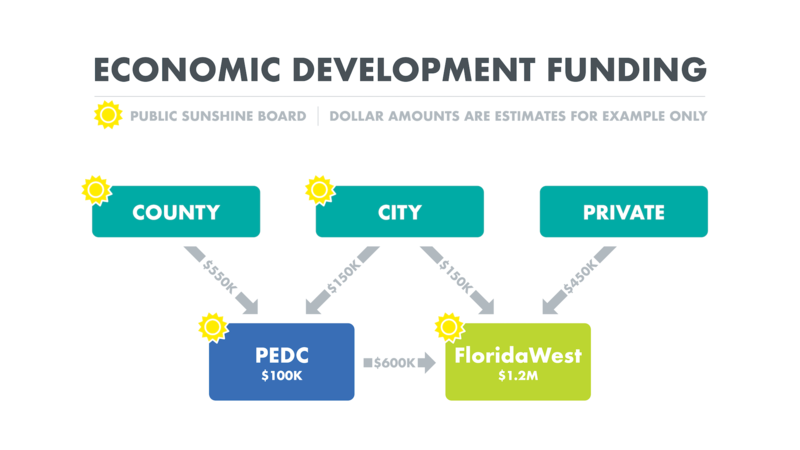 The FloridaWest Economic Development Alliance is the region’s economic development organization with the mission of building, growing, and sustaining the economic potential and prosperity of Northwest Florida. Through an alliance with more than 100 public and private community and business leaders, FloridaWest is collectively strengthening the region’s social, human, and business capital. FloridaWest is governed by a board of directors comprised of nine business and community leaders.